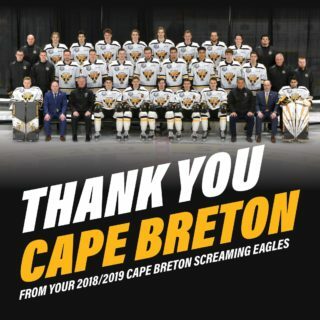 The Cape Breton Screaming Eagles ended up on the wrong end of 7-4 game in a back and forth game at Centre 200 against the Gatineau Olympiques. The Eagles found themselves in a hole after a bad bounce 80 seconds into the game. 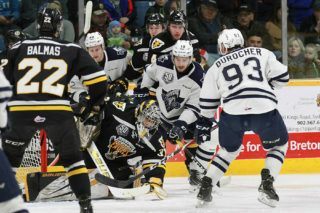 Maxim Trépanier came up the right side of the ice, attempted to pass across to Jeffrey Durocher, but the puck deflected off of Mathias Laferrière and past Cape Breton netminder William Grimard, and the Olympiques took a 1-0 lead. It would be the only shot credited to Gatineau for the period, as the Eagles outshot the Olympiques 11-1 after twenty minutes. But the score remained 1-0. When the Eagles would solve Tristan Bérubé, they would do so twice in less than a minute. Cape Breton received their own fortunate bounce for a tying goal at the 6:34 mark of the middle frame. A Leon Gawanke shot was blocked out by Bérubé, and the rebound was swatted out of mid air by Alex Drover. Egor Sokolov took the rebound and shot the puck toward the goal, and it ended up in the feet of Gatineau defender Chris McQuaid and into the net, and it was a tie game. 57 seconds later, the home side would get its first lead of the game as with bodies all around the front of the net, Isiah Campbell would swing around the net for a wraparound marker to make it a 2-1 game. Just past the 11 minute mark the Olympiques would tie the game as defenseman Gabriel Bilodeau dangled through the Eagles zone, and deked by Grimard to tie the game at 2. Gatineau would then score twice in the final six minutes of the second stanza to establish a 4-2 lead. The Olympiques took the lead when a David Aebischer shot from the blueline went through traffic at the 14:14 mark. Then Gatineau added to the margin when Charles-Antoine Roy converted a nice cross-ice feed from Pier-Olivier Roy to finish the scoring for the period. Cape Breton would end the second period on the power play, with the bulk of the man advantage taking place in the third period. The Eagles couldn’t score with the extra man but kept the puck in the Gatineau zone, and Shaun Miller would score a wrap around marker though the wickets of Bérubé. With less than six minutes remaining the Eagles comeback hopes would take a hit when Leon Gawanke was sent to the penalty box for tripping. Maxim Trépanier would pot his second goal of the evening to push the Gatineau edge to 5-3. Now trailing by two goals, Eagles coach Marc-André Dumont would lift Grimard for an extra attacker. Charles-Antoine Roy would find the open goal to add to the Gatineau advantage and the game appeared to be over. But the Eagles would show some push back, as just 22 seconds later Félix Lafrance would convert a pass from Laferrière to cut the lead once more. It was the first goal of Lafrance’s QMJHL career. 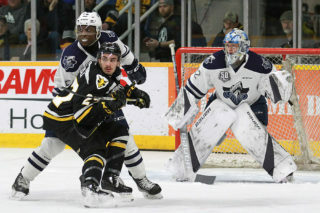 With the margin again being two goals, Dumont elected to lift his netminder again, but after some good pressure by the Eagles Giordano Finoro would find the open cage to give Gatineau a 7-4 victory. Bérubé would pick up the victory in goal, stopping 35 of 39 shots. Grimard took the loss, allowing 5 goals on 22 shots in addition to the two empty netters. 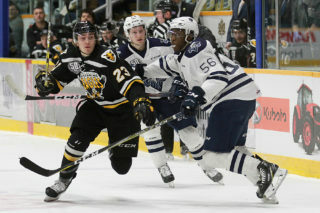 The Screaming Eagles now hit the road for a four game road trip, beginning Tuesday night in Saint John against the Sea Dogs. You can catch all the action beginning with the pre-game show with Patrick McNeil at 6:30 on 1270 AM CJCB or online at www.cjcbradio.com.